Michigan Republicans are turning up the volume on claims that Mark Schauer, the Democratic candidate for governor, is a jobs killer. Statements on their website www.migop.org reprise criticism of Schauer’s support for the 2009 federal stimulus bill, when Schauer was in Congress. Schauer, who also served in the state senator, is running against incumbent GOP governor Rick Snyder on the Nov. 4 ballot. This marks at least the third time Schauer has been attacked over his vote for American Recovery and Reinvestment Act, also known as the stimulus package. The state Republicans point out that some stimulus money went to foreign companies to develop renewable energy. As the Truth Squad has pointed out, Schauer did indeed vote for the stimulus bill. Foreign companies received contracts as part of the $21 billion the stimulus package provided for incentives to create renewable energy. However, this claim omits important context: foreign companies received the contracts because of a lack of American companies capable of building key components to produce the wind and solar power, as noted in Politifact. It’s also worth noting that the stimulus package “increased the number of people employed by between 1.4 million and 3.3 million,” according to the nonpartisan Congressional Budget Office; and the stimulus sent Michigan more than $17 billion in stimulus money, according to ProPublica. To support its claim that Schauer ‘s vote could cost the state 96,000 jobs, state Republicans point to a study by the National Association of Manufacturers on the possible effects of the cap and trade limits on greenhouse gas emissions. “This tax would deal a blow to employment in Michigan, with a loss of worker income equivalent to 22,000 to 33,000 jobs in 2013 and 75,000 to 96,000 by 2023,” NAM concluded. The use of the word “could” indicates the claim’s speculative nature, but also highlights the difficulty in finding fault with it. The job-killing policies that the GOP is referring to here is the Affordable Care Act. Earlier this year, the Congressional Budget Office wrote that the ACA, commonly known as Obamacare, will contribute to the equivalent of 2 million workers out of the labor market by 2017, as employees work fewer hours or decide to drop out of the labor force entirely. This accurately depicts the budget office’s estimate. And is half the story. The CBO projected that more workers will choose not to work, which arguably is not the same as “job-killing” or reducing the number of jobs. In 2009 the Mark Schauer for State Senate Committee was fined $208,250 for improperly donating money to help elect Democrats to the state Senate in 2006. The Michigan GOP has characterized the 2009 campaign finance fine as “essentially money laundering” on its website. It was and continues to be the largest fine for a campaign finance violation ever levied by the Secretary of State Office. However, it is no longer true that Schauer currently is being investigated for two violations. The other two possible violations the Michigan GOP refers to complaints the Michigan GOP itself filed this year with the Bureau of Elections against Schauer. In August, the state GOP claimed that Schauer’s campaign broke the law when it paid for a website and yard signs that read, “Mark Schauer Lisa Brown For Michigan." The complaint cites state law that does not allow one campaign committee to contribute to another and claims that Schauer and his running mate Brown have separate campaign committees. So, according to the GOP, by putting Brown’s name on websites and yard signs Schauer is donating to Brown’s committee, thereby breaking the law. This complaint is not likely to be resolved before election day, said Fred Woodhams, a spokesman for the bureau of elections. In a second complaint, dated Sept. 4, the party accused Schauer of spending more on a worker’s salary than is allowed by campaign finance laws. The bureau dismissed this complaint on Sept. 23 after receiving proof from the Schauer campaign that the reported salary amount was a reporting error. 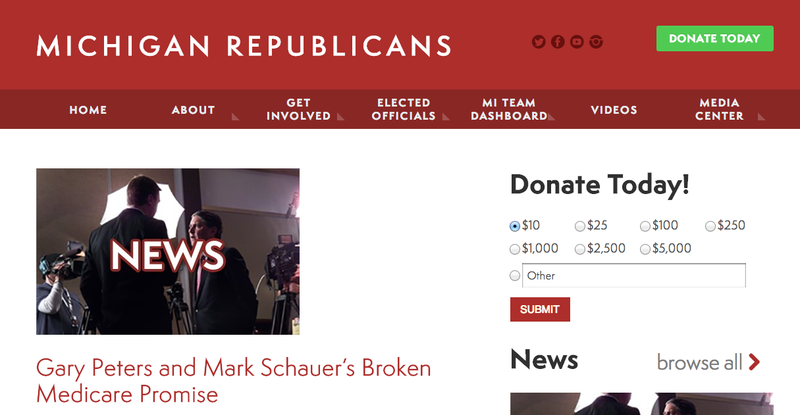 Despite the dismissal, the GOP website continues to claim that Schauer is being investigated for two possible violations. Many of the accusations are true but provide only half the story. Take the charge that Schauer voted to send stimulus money to foreign companies. The GOP failed to note that the money went overseas only because of a shortage of U.S.-made components to produce wind and solar power. But as Truth Squad has often noted, campaigns are not required to acknowledge all sides of an issue. Truth Squad gives a warning, however, because the GOP site continues to say Schauer is being investigated for two possible campaign violations. It’s been two weeks since one of those complaints (filed by the state GOP itself) was dismissed. Hello, GOP website editors, are you there…?